Happy Thursday friends. I hope your week is going great - mine is! I'm glad the elections are over so the country and our people can move forward. Have a lovely weekend! Love it! That necklace is gorgeous! 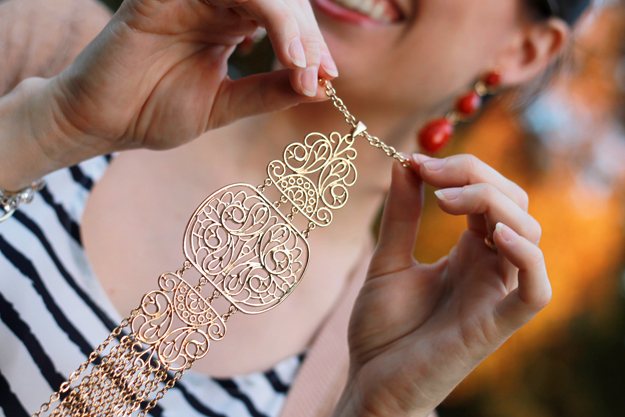 Love big jewelry! Such a gorgeous necklace! Great casual chic outfit. Love those shoes too! love this outfit, the jewelry, and your shoes. amazing styling!!! LOVE! xO! Your necklace is so beautiful! Looking amazing! The necklace is awesome! The cardigan is beautiful too. Kisses sweetie. That necklace is so cool! I'm all about having a statement necklace that can define an outfit. Awesome necklace and cardigan! I love the stripes too! And looking effortlessly pulled together + chic as always friend! That necklace is awesome! What a great F21 find! So pretty, you know I've always liked that cardigan. Love the necklace too. Cute! love the look that that super long necklace adds, and I really like that you can see the stripes from your top through that sheer cardi. I can't believe that necklace is F21! Very cute!!!! Stripes and lace - what a pretty combo. And I love those shoes! 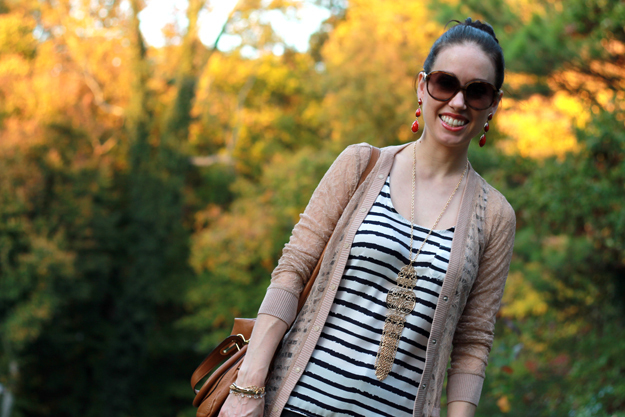 What a GREAT lace cardigan! Such a lovely necklace !!! What an amazing necklac, so pretty. Also love the stripes, such a classic look. Great necklace! Really pretty cardigan too! beautiful accessories and all little details!! Awesome necklace! You look soo pretty! The necklace looks great with your outfit! Love it!